If you've been in a relationship for a long time, chances are at times you've felt that you're merely living side by side. You miss the fun and excitement from when the relationship was new. A rut has formed where there used to be adventures. Guess what? You don't have to stay feeling this way, but it is going to take some work on your part! I've been with Matt for 20 years (married 15). I love him, always have and always will, but there are times where our relationship is....basically put on the back burner because of other responsibilities (children and work). Sometimes it's easy for me to live in the rut, but more often than not I struggle with it. I think because I work from home, my mind has a little more time to wander. I don't want a rut-filled, unhappy marriage. I want (like everyone) to be in a happy and healthy relationship. Over the last 2 decades, I've realized that happy and healthy relationships don't just happen. Like everything else that's worth having, they take work and dedication. So, I find ways to "happy up" our relationship. This one can be difficult if you don't have friends and family nearby, or if you're like me and don't like sending the kids away for too long. The work-around is just waiting until you've put them to bed. Last night, for example, Matt and I simply made time to watch a movie together after we put the girls to bed. It was nice to sit and laugh together, and on a Monday, which always feels like the most rut filled day of them all. Matt works crazy hours. I use the phone heavily, but since he's not always able to answer, I leave flirty texts. You might have to be careful if your significant other has a phone provided by their employer, but even something as simple as XOXO lets them know that they are on your mind and that you are missing them. You can do with this advice what you wish, but I don't mean it in an R-rated way. What I do mean is make sure you reach out for their hand when you are walking side by side. Playfully tickle them as you walk by. Give them a nice shoulder rub after they get home from work. Snuggle with them as you watch a movie together, on a Monday night, after the kids are in bed! 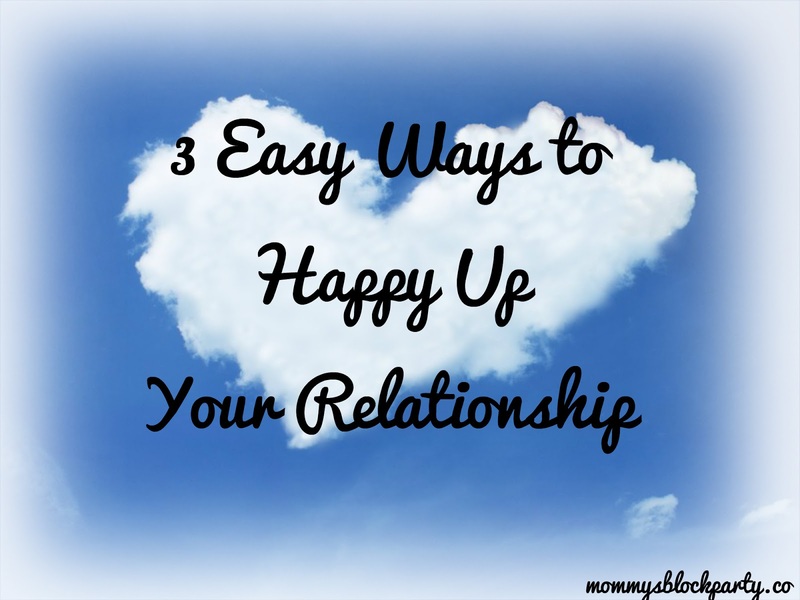 What are some of the ways you "happy up" your relationship? We'd love to hear all about the PG ways you find work. Be sure to leave a comment!